Ms. Frances Lucille Bradford, age 88, of Fairview went to be with her Heavenly Father Wednesday, January 2, 2019. She was born August 8, 1930 in Fayetteville, Tennessee to the late Walter and Alice Stevenson. She is also preceded in death by her sister Edith Orr and son-in-law, Jerry McCord. 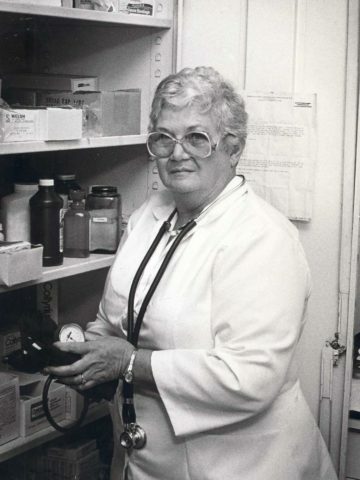 For over 20 years, Frances worked as a registered nurse at Nashville Electric Service. After her retirement from NES, she worked at Richland Place in Nashville for a few years. Frances loved flowers, fishing, reading and Braves Baseball. She is survived by her daughter, Debbie McCord; son, David Bradford (Carolyn); son, Danny Bradford (Joann); daughter, Diana Hardin; daughter, Donna Grainger (Jason); brother, Lawrence Stevenson; 10 grandchildren; 10 great-grandchildren; and 2 great great-grandchildren. The family will receive friends from 5-8 p.m. Sunday and from 11 a.m. – 12 Noon Monday at Harpeth Hills Funeral Home. A celebration of life funeral service will be held at 12 noon, Monday, January 7, 2019 in the chapel of Harpeth Hills Funeral Home with interment following in Harpeth Hills Memory Gardens. My prayers for Mrs. Bradford’s family and friends. She and I worked together in the Safety office at NES the first 8 years I was there. She taught me many things during those years and was very nice to work with. I also worked with Mrs. Frances for 8 years at NES. She was a great friend and mentor. She will. E sadly missed. A grate Mother to all of the friends of the family . She will be missed by all. I worked at NES and knew Ms. Bradford to be very knowledgeable and helpful when I had to go to the dispensary…I will add the first time I showed up in the dispensary with a sore throat, she told me to open wide and she schwabbed my throat with iodine…that was a first for sure, but it did seem to ease the discomfort. I do sincerely offer my condolences to the family.